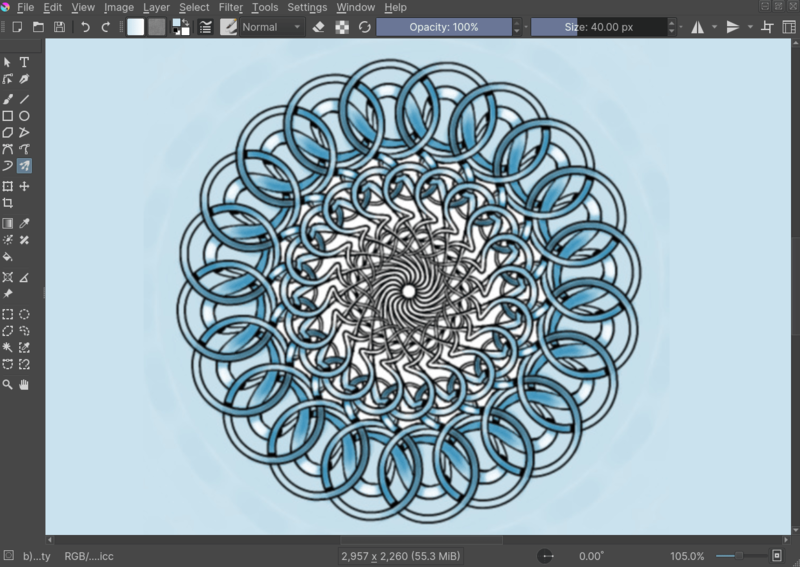 The Multibrush tool allows you to draw using multiple instances of a freehand brush stroke at once, it can be accessed from the Toolbox docker or with the default shortcut Q. Using the Multibrush is similar to toggling the Mirror Tools, but the Multibrush is more sophisticated, for example it can mirror freehand brush strokes along a rotated axis. The settings for the tool will be found in the tool options dock. The multibrush tool has three modes and the settings for each can be found in the tool options dock. Symmetry and mirror reflect over an axis which can be set in the tool options dock. The default axis is the center of the canvas. Symmetry will reflect your brush around the axis at even intervals. The slider determines the number of instances which will be drawn on the canvas. Mirror will reflect the brush across the X axis, the Y axis, or both. Translate will paint the set number of instances around the cursor at the radius distance. This works as a mirrored symmetry, but is a bit slower than symmetry+toolbar mirror mode. The assistant and smoothing options work the same as in the Freehand Brush Tool, though only on the real brush and not its copies.